I'd imagined for a few moments a stop-action film of anthropomorphised valves, complete with arms and legs as well as accoutrements [ hats, canes, etc. ], dancing about during this track, ,complete with optically-printed lightning bolts in red, along with slogans proclaiming the superiority of the valves . 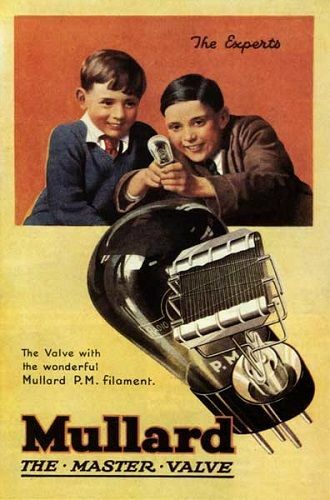 Was a Mullard Valve or two seen out in your father's shed? 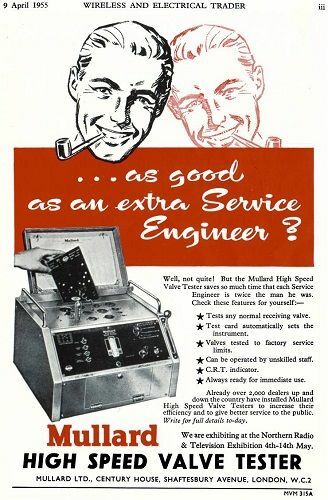 Were these the types of adverts you'd see within the pages of your father's Practical Wireless magazines ? Are the above types the Valvemen ? 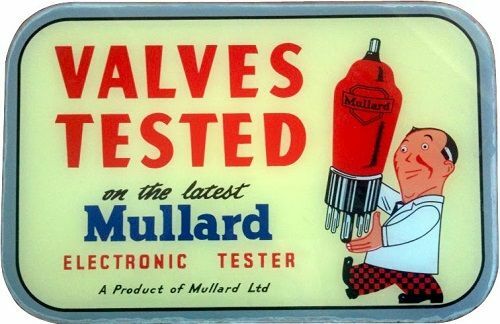 Dad did indeed have Mullard valves in his radio shed at the back of 28 Conistone Crescent in the 1950s. But the 'valvemen' were actually weird characters in a funny science fiction strip in a 1950s weekly comic. Can't remember if they appeared in the Beezer, Topper or Rocket comic...they were not the main character but secondary ones and, very much like you imagined, were denizens of another planet and resembled valves with arms and legs. 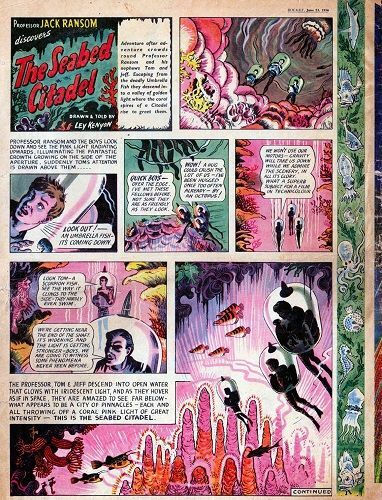 Not The Valvemen but more like jellyfish men, these from Jack Ransom's The Seabed Citadel, drawings by Ley Kenyon ? Sort of reminiscent of a place where humans and valves might meet . Thanks for that link to 'Blimey' alec...great to see some pages from 'The Rocket' comic after all these years. I loved that comic and was very sad when it was axed. Looking through Beezer and The Topper, suddenly I remember the name Topper Headon [real name real name Nicholas Bowen Headon], formerly the drummer from The Clash and, sure enough, his Wikipedia entry explains that he was nicknamed "Topper" due to his resemblance to The Topper cover star, Mickey The Monkey . The resemblance is there but mightn't Mo Howard [The Three Stooges] be an even more apt comparison to Mickey The Monkey ? I associate the name Mickey The Monkey with a song of the same name by Tiny Tim . That song creeped me out a wee bit when I was a kiddo . Also I see that a Beezer character was called Sting . That's a nice image, tm14 .